Baitrunner LC The big and Medium Baitrunner Long Cast series are back and they are fitted with Shimano's latest technologies. They feature long cast AR-C spool design and Aero Wrap II, this combination ensures maximum casting performance from the shoreline. The Shimano Long Cast Baitrunner and Baitrunner Medium also have X-Ship which ensures the smooth function of the internals and Hagane Gear provides enduring performance. Fitted with 4+1 Shielded AR-B bearings and available in a 5500 and 14000 size with a drag output of 15kg and 20kg respectively. 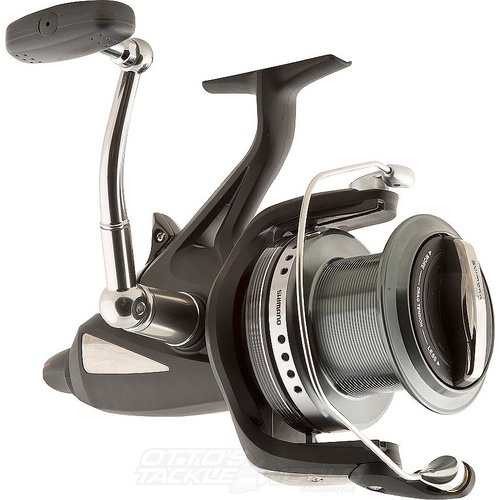 The Shimano Long cast Medium has 15kg of drag and is still more than capable of fighting the biggest of Jewies and will be more suitable for tailor and salmon and smaller fish, the Shimano Long Cast Baitrunner Medium is a lighter reel and will double as a light casting reel with Metals and plastics. All Shimano Baitrunner Long Cast reels will double both as land based and Boat reels but are ideal for beach fishing as you can click the Baitrunner on and not have to worry about your rod and reel being dragged into the water by a big fish.